Literally "books having false titles," fraudulently or erroneously ascribed to the authors whose names they bear. "Thus Dionysius of Halicarnassus speaks of "pseudepigraphic orations" of Demosthenes; that is, orations commonly attributed to Demosthenes, and included in collective editions of his works, but not really by him ("De Admirabili Vi Dicendi in Demosthene," ch. lvii.). Similarly Serapion, Bishop of Antioch (190-203), says concerning the Gospel of Peter: "We receive Peter and the other apostles even as Christ; but the writings ["Pseudepigrapha"] which are falsely inscribed with their names we reject" (in. Eusebius, "Hist. Eccl." vi. 12). 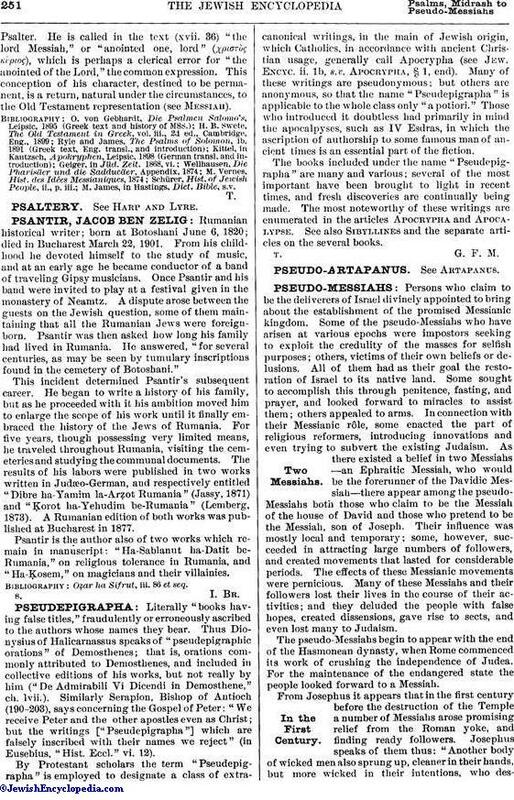 By Protestant scholars the term "Pseudepigrapha" is employed to designate a class of extracanonical writings, in the main of Jewish origin, which Catholics, in accordance with ancient Christian usage, generally call Apocrypha (see Jew. Encyc. ii. 1b, s.v. Apocrypha, § 1, end). Many of these writings are pseudonymous; but others are anonymous, so that the name "Pseudepigrapha" is applicable to the whole class only "a potiori." Those who introduced it doubtless had primarily in mind the apocalpyses, such as IV Esdras, in which the ascription of authorship to some famous man of ancient times is an essential part of the fiction. The books included under the name "Pseudepigrapha" are many and various; several of the most important have been brought to light in recent times, and fresh discoveries are continually being made. The most noteworthy of these writings are enumerated in the articles Apocrypha and Apocalypse. See also Sibyllines and the separate articles on the several books.